When it comes to providing your visitors with a platform that can entertain their amenities such as sign-up process, listing services and products for sales, a proficient website template can be your out of the box pick. You might be looking forward to establishing a full-fledged online shopping store, well, what comes a great fact is that, a variety of great eCommerce templates are available at your disposal to serve the purpose. It’d be evident to say that website templates can provide your site with a premium look as well as high-quality pictorial presentation. Always remember that a great template can cast an ever-lasting impression on your visitor. Users can list their local businesses as well as services online & that too with an added ease. 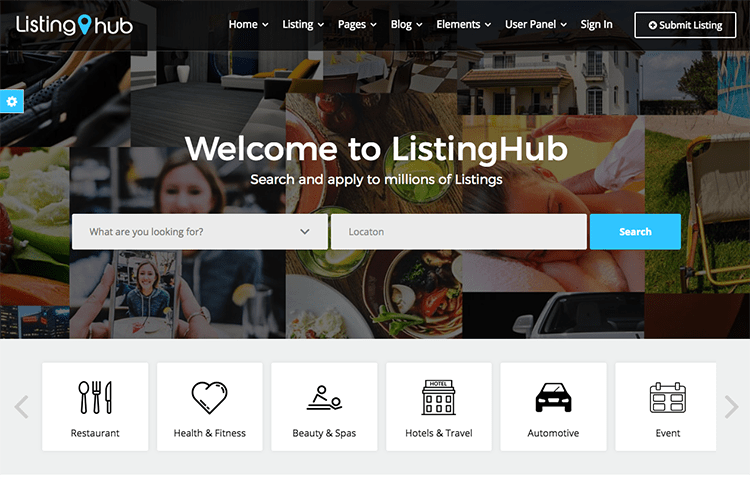 The listing submission process has been simplified by website templates to a greater extent. This has resulted in an easier addition of classifieds for the users. 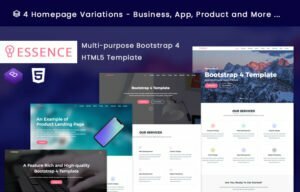 With an array of multiple homepage layouts, classified templates can provide your website with the modern as well as a diverse look, the same will add grandeur to its classified listing ability as well. Every template has a specific operation, there might be the case where you just want to allure the visitors to read the content of your website. On the other hand, you might wish to interact with visitors through form submissions etc. Whether it’s shopping cart design variation, informative descriptions, user-friendly navigation or even filters, a proficient eCommerce website template can ensure a booming growth of your overall endeavors. The unprecedented benefit that comes handy with the customized Classified Ads & listing website templates is that your website might rank higher in search engine ranking. This is due to the fact that, the code written for the website is unique and clean as well. The cross-browser compatibility can be achieved by the same as well. This will boost your site’s visibility amidst the masses & hence you may obtain an unprecedented level of sales and growth. 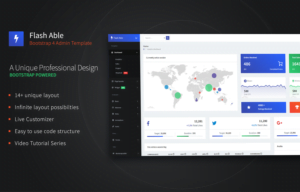 The ravishing feature of website templates Availability of features like customized dashboards, control panel, attractive user-interface is what makes website templates a preferable choice. The same can provide the sellers with a deemed option to get access to the dashboard as well as manage the adverts. The templates ensure a great support for the mobile users around the world. A great classified theme can provide you with a great way to make money, create multiple pricing modules, set the categories, create membership packs and much more. A wide range of website templates features a great support for PayPal when it comes to making the payments. The visitor can obtain an easy checkout process with the same, this is a plus point as well. One can also add add-ons with their classifieds website templates for the purpose of generating money through an attractive interface as well as content. 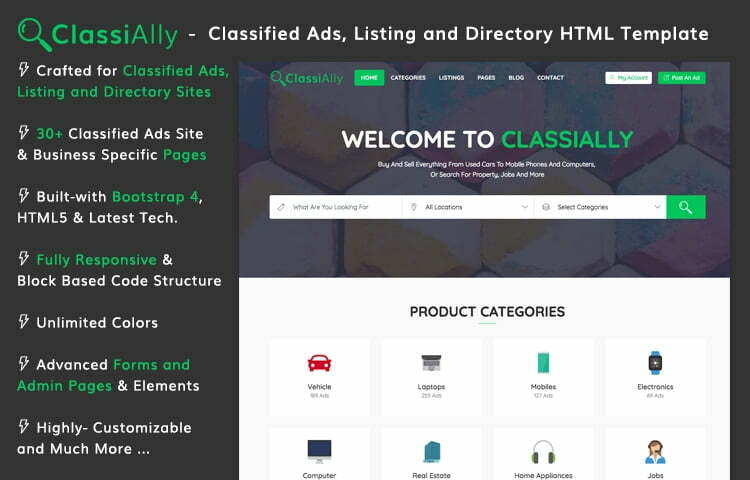 If you’re looking forward to having one of the best HTML5 based classified ads template, then ClassiX can be your out of the box pick. With a great as well as modern design, the responsive layout ensures a full & a viable support for the user. The template comes handy with two deemed homepage variants for the user. You can customize and obtain over 23 pages for publishing the content, classified, directory etc. The template is easy to use and is highly customizable, it features the latest version bootstrap for the users, the template code rests on CSS3 & HTML5 languages. An alluring revolution slider has been given with the template as well. 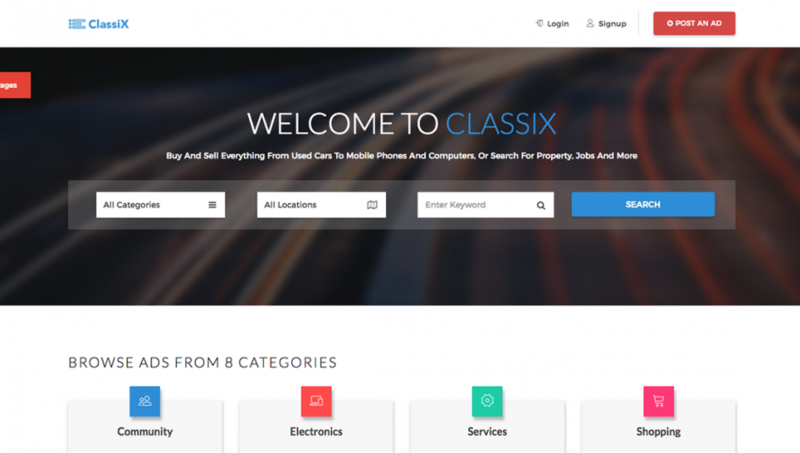 ClassiX is One of the most user-friendly classified ads website templates in the market. The template thrives on its customization ability to cater the specific needs. Overall, if you require a rich documentation of the content, ClassiX is your best pick. An eye-catchy appeal has been ensured through the template for the users around the world. A cross-platform support is also there. 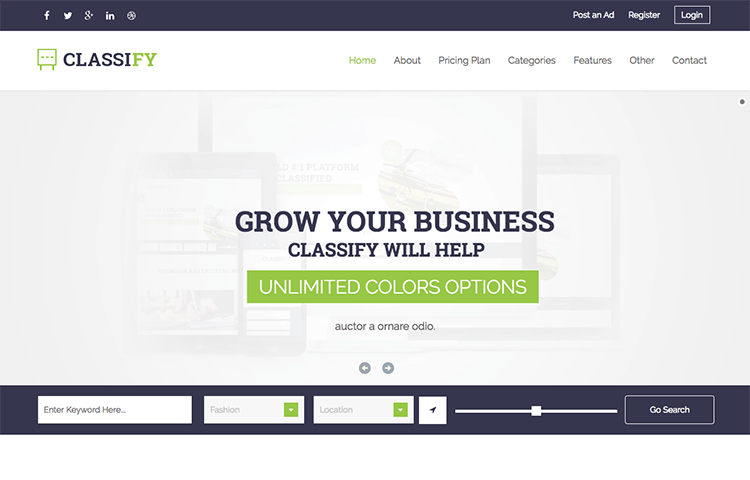 ClassiAlly is modern classified ads and listing website template built with Bootstrap 4. It’s very well-designed template specially crafted for all sort of classified ad sites. ClassiAlly comes with 30+ classified ads site specific pages. It’s very easy to customize, packed with SASS style files, coded as block based structure. 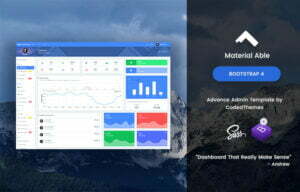 It has free and premium version both so, you can give a try free lite version before you go for full version for professional use. The template can cater to your Classified Ads requirement in the best possible way with over 30+ Job portal pages under its vicinity. 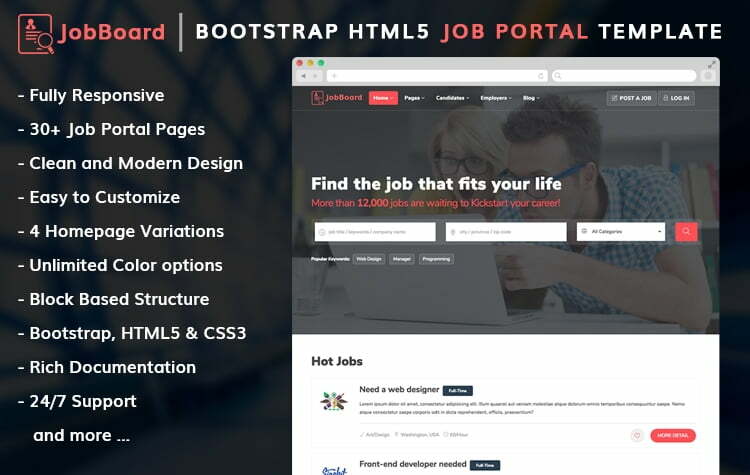 What comes as a great fact is that, the user can obtain over 4 homepage variations with JobBoard HTML5 website template. 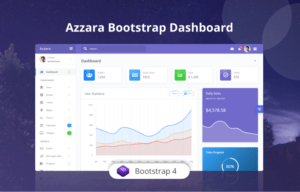 Talking about the features of the template, in addition to the revolution slider, the template features a Bootstrap 3.3.7 version to the users. Customizable forms add grandeur to the overall viability of the template. LESS support has been ensured through JobBoard website template. 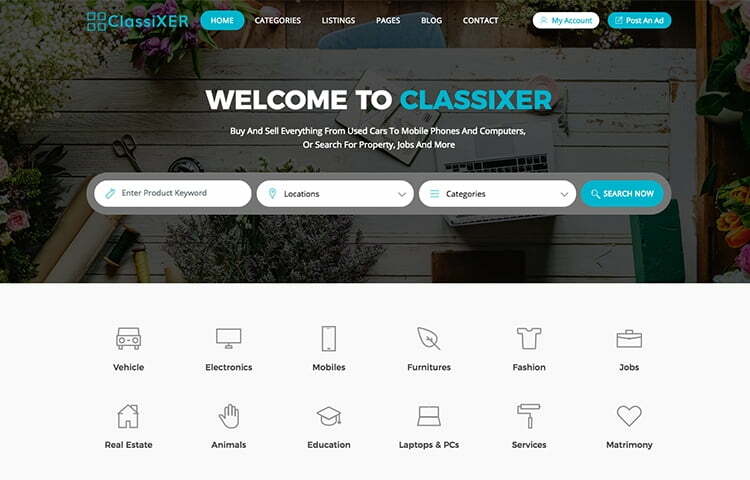 ClassiXER is modern Bootstrap 4 Template Specially crafted for Classified ads, Listing and Directory Websites. 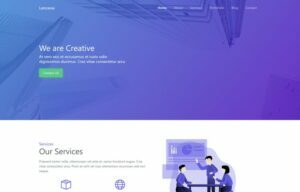 This is very well-designed template built-with all latest technologies such as: Bootstrap 4, HTML5, CSS3 along with SASS. 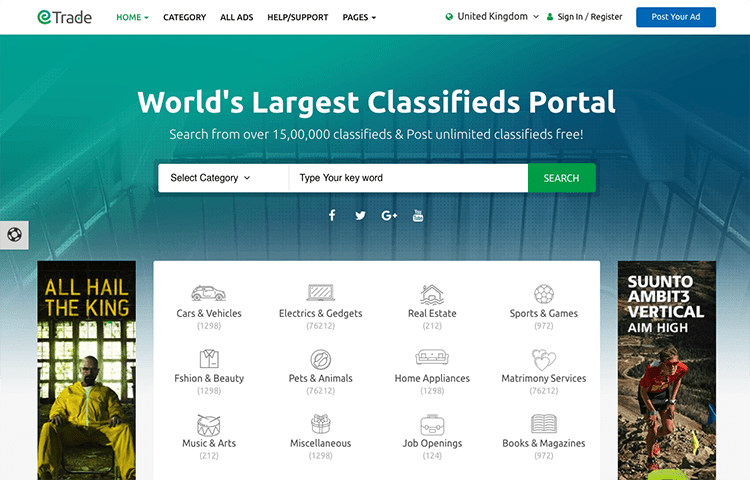 ClassiXER comes with 30+ Classifieds Specific Pages, If you wants to build a professional Classified CMS or Website ClassiXER is best choice for you! Catering to your professional as well as high-quality website needs, EstateX is breaking the stereotypes. 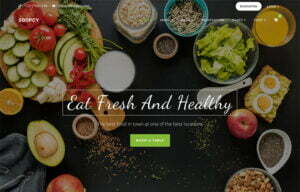 Built with HTML5 as well as Bootstrap, the website template can be of great worth. With a never-ending array of great colours, a user can leverage the potential of 3 customizable homepages. A diverse cross-browser support is also there for the users around the multiple platforms. A deemed level of support has been given for the integration of Google Maps on the site. Built-in pages feature aspects like About us, home page + theme slider etc. are of great worth to the user. 50+ built-in pages, as well as blocs, are ready to cater your every need. 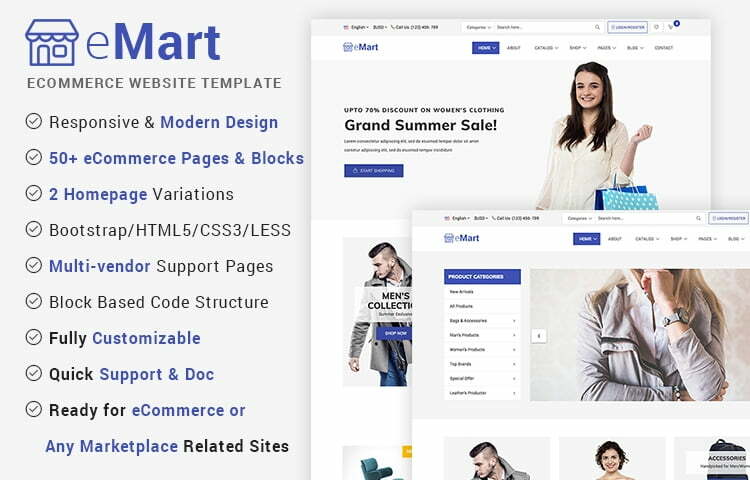 eMart is one of the most popular & modern eCommerce website template available in the market. The template can be best suited for any scale of e-commerce business operation level through 60 plus pages for the website. Features like a call to action, two sliders, dashboard, quick view, cart and much more can aid the shopping experience of the customer. Icon packs are also available with eMart e-commerce website templates; a flat & material design appeal has been ensured by the template. Built through HTML5, Bootstrap, CSS3, the stylesheet has been generated via LESS. 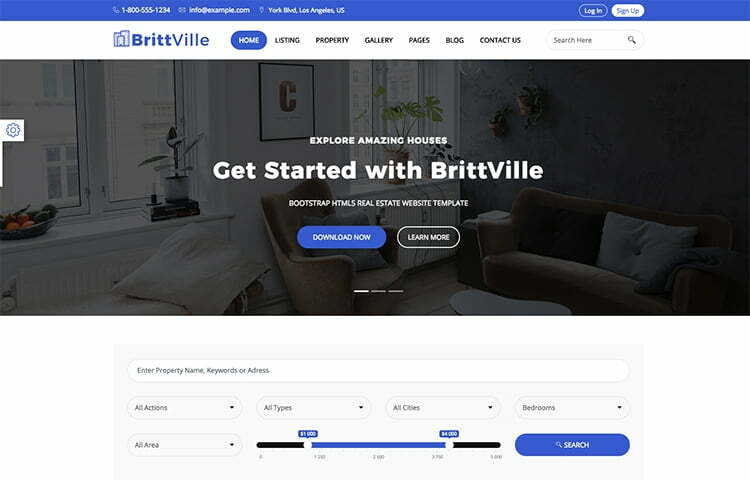 BrittVille is HTML Real Estate Template, Crafted for Real Estate, Property and Listing Websites. It comes with refreshing design, tons of real estate pages, blocks and sections to build almost any kind of real estate website or CMS. BrittVille packed with all modern features and addons to make it robust and its usability efficient for users. It includes 28 HTML pages and all essential elements you need for a property related website. Also it is highly-customizable template (coded with SASS) and block-based code structure so, you can make change very easily! 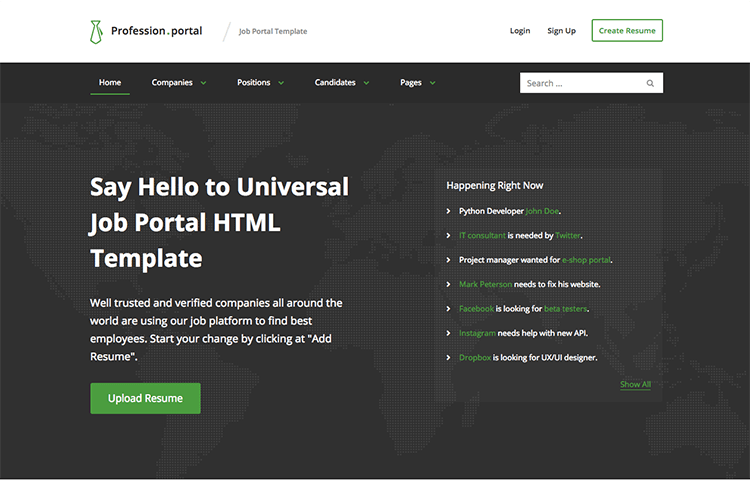 TheHunt is great professional Job Portal Website Template based on Bootstrap 4 and HTML5. It comes with two unique homepage variations, refreshing design, 30+ job board specific pages and tons of ready to use elements. 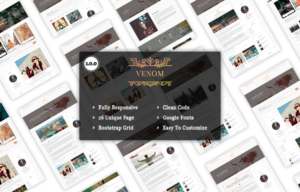 This is a highly-customizable template packed with all essential plugins and addons. TheHunt is a developer friendly Job Portal template as it comes with SASS files which offers extensive customization and flexibility. 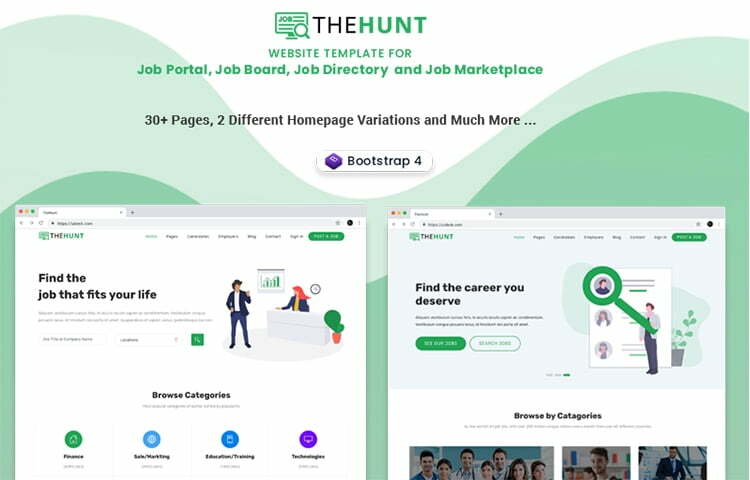 If you are looking for a powerful job portal, job directory or job board template, TheHunt is definitely perfect choice for you. 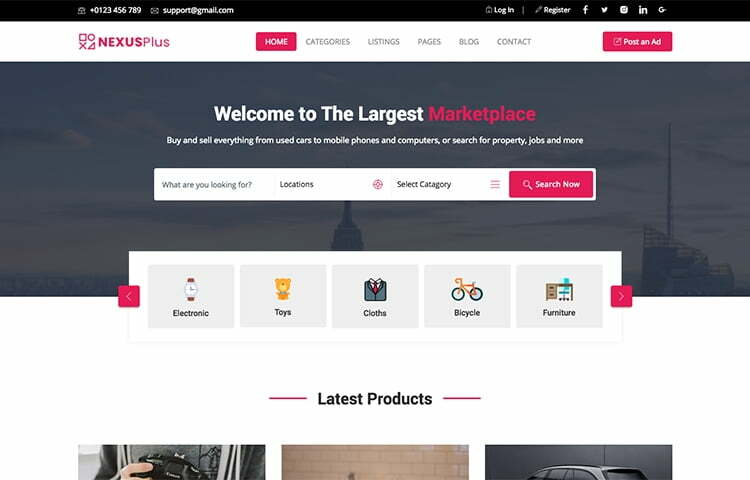 NexusPlus is High-quality responsive classified ads, listing and directory template, it is comes with 2 different homepage variations, 20+ classified ads specific pages and features to create a full-featured Classified ads website or CMS. NexusPlus is also built-with Bootstrap 4 and all modern technologies to make it efficient for developers to work on it. NexusPlus designed by focusing on overall UX and usability, its simplified design says so. As a classified ads web template you can expect everything you need to get started your listing/directory/classified site. 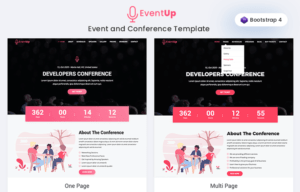 With a flexible as well as a responsive design appeal, Classify website template is a great option for those looking forward to having an easy to setup template. Based on languages like HTML5 & CSS3, Classify template is best suited for classified ads related websites. Aspects like, usability as well as typography, have been focussed. The design is clean, responsive and modern in nature, cross-browser platform support is also there for the users. A great level of SEO support has been featured in the template, social media icons are also available. Classify website template can create a jolly website experience for the visitors. What comes as a great fact is that, sliders provided with the template are touch swipe compatible. 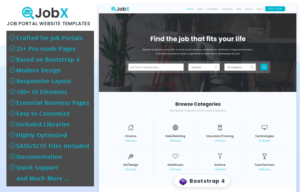 Trade is one of the most sorted Classified ads template available for the use, the template features a Bootstrap 3X framework to the user. It can be said that classified ads sites can leverage the potential of the Trade website template for the purpose of great business development. 100 % responsive design, clean as well as novel appeal & blend of CSS3 and HTML5 are what make Trade template different than the rest. A diverse and unprecedented responsive layout is given with the same, cross-platform support has also been catered. Multi-vendor supportive support for pages is also there, the layout is absolutely responsive. A special support for pricing page and coming soon page has been ensured with Trade website template. Do you require a template that can cater to your advanced job website needs? Well, Profession website template is one such template equipping the users with advanced control on their website & providing a happy site experience to the visitors as well. With the addition of technologies like SASS & BootStrap makes the template popular and important as well. The material design is promising; the template is built with LESS. SEO optimization support has been ensured by the EstateX website template. The template comes handy for aspects like Google Maps, submission pages, emailers, and much more. Best suited for Job portals, the template will ensure a clean, dapper and modern design for your website. With a diverse range of short-codes as well as elements, Listinghub can bestow upon your expectations. With a mesmerizing parallax effect, charm your visitors with your gaudy website. 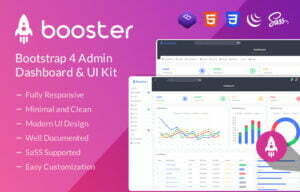 Based on Bootstrap 3, a cross-level support has been guaranteed by the website template. Best suited for listing purposes like real estate, a user can obtain a viable experience through the same. The layout featured is fully responsive, the user can create a full-fledged portal system for jobs with the aid of the same. The customizable plugins featured with the website templates are 100% premium in nature. 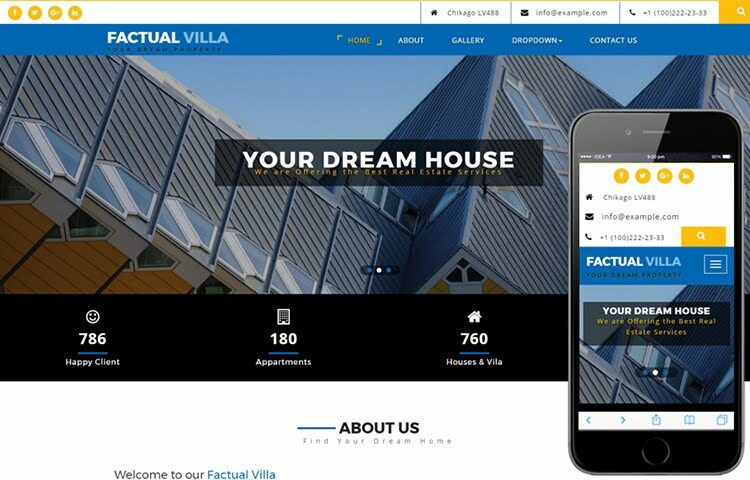 For the real estate enthusiast out there, Factual Villa is a ravishing website template that may ensure the required growth for your website. Website segments like property sellers, real estate agency, classifieds, directory and much more can leverage the inevitable features of the template. 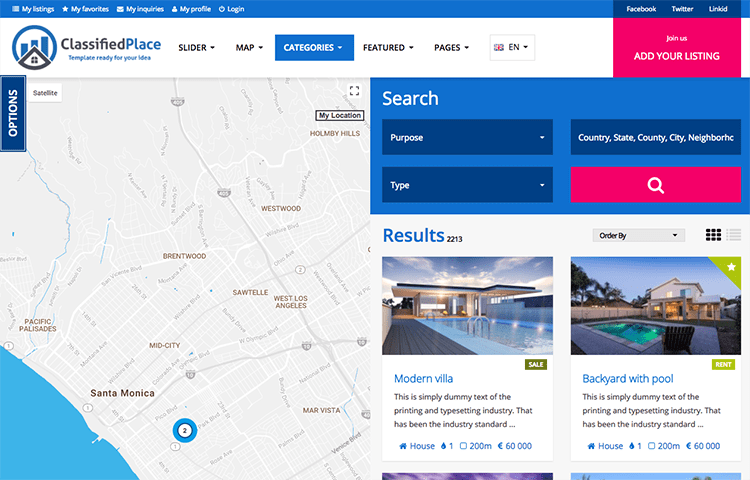 Built with JQuery, CSS3, HTML5 & Bootstrap framework, Factual Villa is setting new benchmarks when it comes to a proficient & attractive website template. 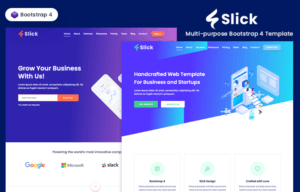 An array of features like customization, great icons, images, parallax effect and much more has been featured in the template. Willing to provide an unprecedented range of features to your customers for the purpose of providing them with the best shopping experience? 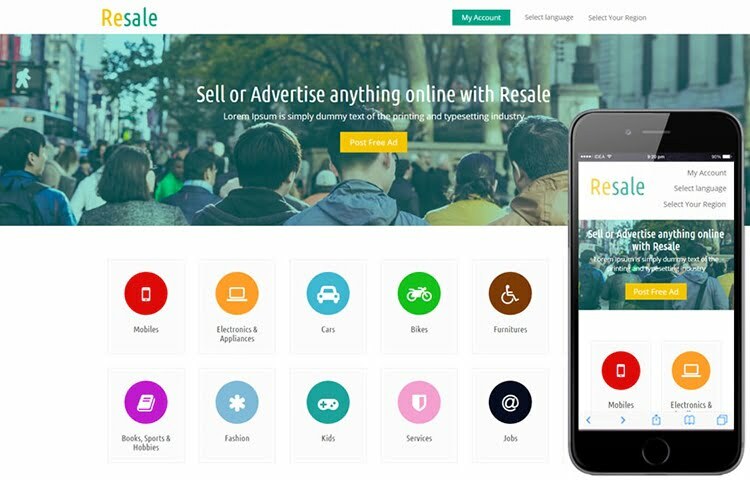 Well, through Resale e-commerce website template, benefit your business website in many ways. Talking about the homepage, the site features a diverse number of animated bold icons for an exuberant appeal. Using filters with website template is pretty fun, sort elements like price, city, colour and much more the way you desire. Based on CSS3 as well as HTML5, Resale e-Commerce website template can be your best pick. A premium appeal can be achieved with the adaption of the same for your website. A clean flat grid system will empower the user with customization. Choosing the best website template for your website can be an important task. It’d be wise to say that an engaging template makes your visitors attached to your site & hence, the services. One can’t just simply ignore the charm of the website templates, choosing a proficient template can boom your classified ads, e-commerce, directory and listing endeavours in an unparalleled way. You may monetize the site through means like displaying adverts, charging a nominal fee for every listing, you might customize the multiple pricing options as well.